Weaving concrete strategies into a lively, entertaining story, this book reads like compelling fiction yet has the heart and soul of informative non-fiction. Look over Mike s shoulder, the lead character in this book, as he acquires the counsel of his doctor, therapist and pastor. Glean from it all, without ever having to pay a single co-pay or donation. Walk along with Mike, as he learns and implements seven critical skills both at work and at home in his marriage. His example paves the way for you to apply these concepts immediately to your own life. This doctor-therapist writing team has condensed the most influential factors of health from their respective fields into one sensible how-to-guide. In effect, they have produced a well-rounded manual for improving one s condition across the major domains of health: physical, psychological, social and spiritual. 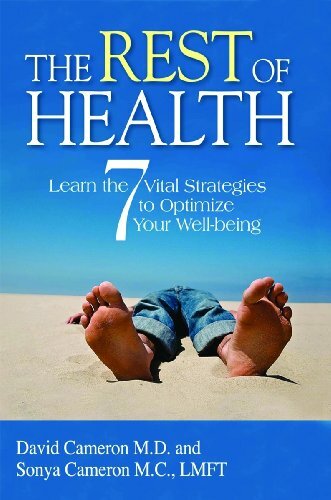 The Camerons have integrated these essential elements of health into a comprehensive framework on wellness. Designed for use by individuals, book clubs or church small groups, this book satisfies the hunger for relevant, adept methods for improving the way you feel and experience life. Created with interactive worksheets, self-assessments and discussion questions, it deeply engages readers and reinforces their learning. Those who apply these influential skills and use the practical tools provided will be launched from mere good intentions into the reality of better health. At last, achieve the health, vitality and peace of mind that you have long desired. The Rest of Health brings to life the most time-tested, true essentials of well-being in one personable, attractive manuscript." David Cameron lectures and researches on online media and communications at Charles Sturt University, Australia.